Evolutionary Computation (EC) deals with problem solving, optimization, and machine learning techniques inspired by principles of natural evolution and - netics. Just from this basic de?nition, it is clear that one of the main features of theresearchcommunityinvolvedinthestudyofitstheoryandinitsapplications is multidisciplinarity. For this reason, EC has been able to draw the attention of an ever-increasing number of researchers and practitioners in several ?elds. In its 6-year-long activity, EvoNet, the European Network of Excellence in Evolutionary Computing, has been the natural reference and incubator for that multifaceted community. EvoNet has provided logistic and material support for thosewhowerealreadyinvolvedinECbut,inthe?rstplace,ithashadacritical role in favoring the signi?cant growth of the EC community and its interactions with longer-established ones. The main instrument that has made this possible has been the series of events, ?rst organized in 1998, that have spanned over both theoretical and practical aspects of EC. Ever since 1999, the present format, in which the EvoWorkshops, a collection of workshops on the most application-oriented aspects of EC, act as satellites of a core event, has proven to be very successful and very representative of the multi-disciplinarity of EC. Up to 2003, the core was represented by EuroGP, the main European event dedicated to Genetic Programming. 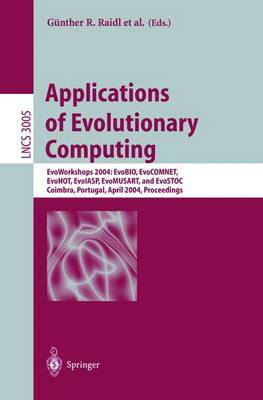 EuroGP has been joined as the main event in 2004 by EvoCOP, formerly part of EvoWorkshops, which has become the European Conference on Evolutionary Computation in Combinatorial Optimization.